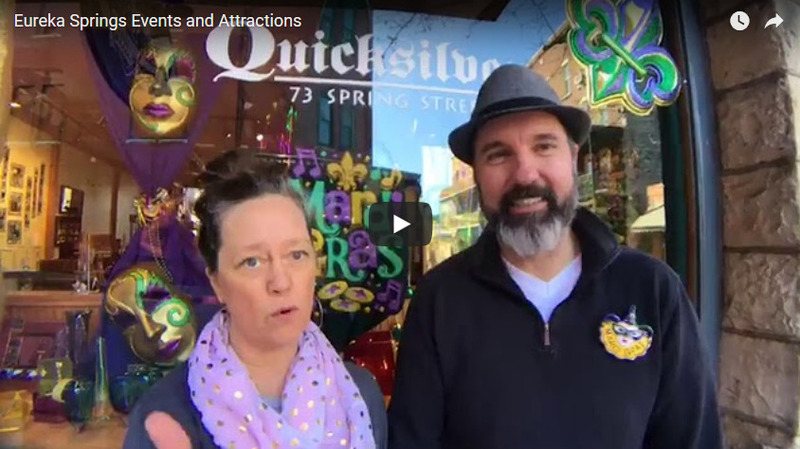 Today’s episode of Eureka Springs Inside Out highlights Mardi Gras and Valentine’s Day. Eureka Springs has one of the best Mardi Gras Celebrations outside of New Orleans. In 2018, the Night Parade will be held on February 3rd at 6pm and the Day Parade will be on February 10th at 2pm. Be ready to catch beads and other great items at both parades. There are 4 main Balls – Two are sold out “Jokers Ball” and “Coronation Ball”, although, the Black Light Ball and the Mayor’s Ball will likely have tickets up to the day of the event. Also, join the Eureka Springs Mayor in the Day Parade on February 10th as part of the Mayor’s Krewe. The Mayor’s Krewe will walk behind the Mayor with their own second line jazz band. The parade will be high energy with dancing in the streets. This will all be an experience that you won’t soon forget. See you soon! An event schedule is available at InEurekaSprings.com or EurekaSpringsMardiGras.org. Eureka Springs The Halloween City! A Eureka Springs Vacation Visitors Guide for events, attractions, lodging, restaurants, shopping, weddings, real estate & more. Also covering Beaver Lake, Table Rock Lake, Holiday Island. © Copyright 2019 InEurekaSpring.com. All rights reserved.